A sensational crime made regional headlines in 1920. 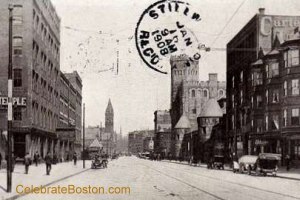 Mrs. Alice Arsenault, owner of a lodging house on Columbus Avenue in Boston, was last seen alive on December 25, 1919. On May 12, 1920, her body was discovered under a pile of ashes in the basement of her house. "Pappas was apprehended in Montreal and was extradited to this country. The discovery of the body came about by a change of ownership of the property. The dead woman, whose body bore stab wounds, had conducted a lodging house on the premises. She was last seen alive on Christmas Day, 1919. There was a large heap of ashes in the cellar at the point almost under the side-walk. It had accumulated all Winter. In May, 1920, the new owner sent for ash-men to clean out the accumulation and they discovered the body. The arrest of Pappas occurred sometime afterward." This murder became known as the Lady In The Ashes case. Pappas had remarried in Montreal and gave his new wife the ring owned by the slain Mrs. Arsenault. It was believed that jealousy was the motive for killing Mrs. Arsenault, because she had given someone else a gift on that fateful Christmas Day back in 1919. It was also believed that Pappas had previously known Mrs. Arsenault for about 15 months when they both separately resided in Revere, Massachusetts. Pappas was found guilty of murder in the first degree on June 15, 1922. He was executed in the electric chair in late June or early July, 1923 for the infamous murder. As a footnote, in those days debris and dirt from sidewalks more easily permeated the basement windows, doors, and grates of inner city buildings. The debris would become wet, then dry, and continually compress; it resembled something between dirty paper mâché and compost. Such debris was referred to as "ashes," with metal garbage containers known as "ash cans" back then.